Harambe, a 17-year-old Western lowland gorilla at the Cincinnati Zoo Handout photo courtesy of Cincinnati Zoo. Several people have asked my opinion on the recent incident at the Cincinnati Zoo. This past Saturday, keepers shot and killed a male gorilla named Harambe in order to rescue a child who had found his way into the gorilla enclosure. Much of the incident was recorded by a zoo visitor. That video is here. It’s harrowing so I won’t post it here or show frightening screenshots. A 4-year-old* boy went over a stainless steel rail that’s a little more than 3 feet high, with vertical bars every eight feet. He made his way through the bushes to the edge of the moat, a distance of approximately 4 feet. From there, he dropped 15 feet to the moat, into a foot and a half of water. The boy, who has not been identified yet by authorities, started splashing around. Keepers tried to call the gorillas inside. Two females in the exhibit complied. Harambe did not. As the crowd around the gorilla enclosure became more and more frantic, so did Harambe. He grabbed the child, pulled him through the water, and began throwing and dragging him around, at one point, according to one witness (in the video), carrying him up a ladder. Zoo officials called in their dangerous animal response team and they shot the the 450-pound silverback dead. The story has engendered predictable outrage, with blame being heaped upon the child’s mother for being inattentive and the zoo for being over-reactionary and/or for being a zoo at all. Animal rights activists have initiated a change.org petition calling for the parents to be held responsible for the gorilla’s death. Celebrities have made uniformed statements as to how the incident “should” have been handled. And anger has flared up on all sides arguing whether or not the child’s life was, indeed, in enough danger to warrant killing the animal. So what are my thoughts? Well, here goes …with one caveat: My opinions are based on the information available as I write this. Sometimes everyone does everything right, and still things go very wrong. I will say this strongly: That child’s mother is not to blame. According to an eyewitness who posted her account on Facebook, the child had been standing directly beside his mother and then ..
…he was crawling so fast through the bushes before myself or husband could grab him, he went over! That’s how fast kids move. And everyone who has had kids long enough knows that to lose track of a child in a crowd, for a few seconds or even minutes is not unusual. In fact, it’s inevitable. In addition, the zoo is exactly the kind of place where kids should be allowed the freedom to run ahead on a path, push to the front of a crowd, climb a decorative rock, or take a shortcut across the grass. That this child was in body-contact with his mother up until the moment he disappeared says a lot for his mother’s attentiveness. The zoo, of course, holds ultimate responsibility for the safety of its visitors, especially the small ones. This means being vigilant about the security of enclosures — both for keeping animals in and for keeping humans out. It’s not enough to make it escape-proof. As one person on Twitter pointed out, it’s a lot easier to fall off a wall than climb up one. Cincinnati Zoo Director Thane Maynard stated that their barriers complied with all regulations and that’s probably true. These kinds of things are built to standards and are inspected regularly. Maynard also said this was their only barrier breach since the zoo opened in 1978. So in terms of the barrier, the zoo did everything right. But nobody can predict or prevent every possible situation. People do the damnedest things. They break into zoos, climb over barriers, jump into enclosures, stick their hands into cages, dangle their children over railings, and taunt animals until they snap. Zoos attempt to mitigate these kinds of things with clear instructions: “Don’t climb on the railings”, “Keep off the rocks”, “Do not place objects or children on the wall”. When adults choose to ignore these warnings, it is to their own peril. But children can’t or don’t read warnings. And even the most well-behaved children can be unpredictable and spontaneous. We all just have to do the best we can to protect them, and to that end, we have to be a village. It was everyone’s job to watch out for that child and still he slipped through. Sadly, this too was necessary. First, we can disregard arguments that the animal should have been tranquilized. These statements come from people who know nothing about gorillas; how they are anesthetized normally (not via dart); how they react to being darted (angry and scared); how long it takes for the drugs to take effect (too long); what they might do while angry and drowsy (anything); and where they might do it (in the moat or up a climbing apparatus). 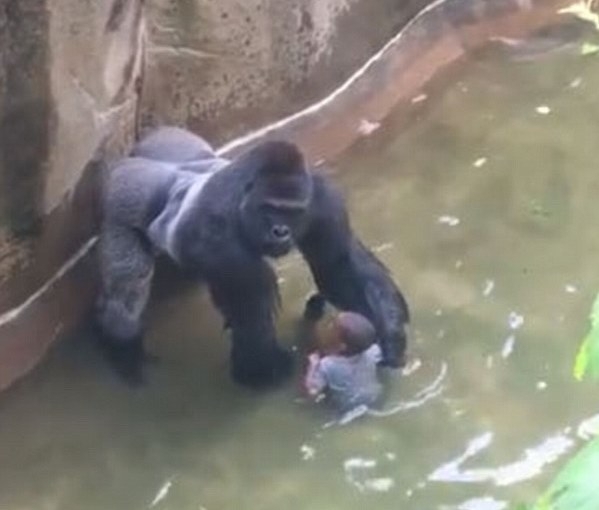 Screen capture from the video showing Harambe holding the boy’s arm. I’ve watched the video several times, I tend to agree with her. He does take a protective stance and he is gentle in between bouts of panic. But here is the thing — it doesn’t matter what Harambe’s intent was. Whether it was protective or aggressive, he was hurting that child. Maybe in the same perfect world where mothers never lose sight of their sons, a gorilla would carefully handle a little boy; a crowd would stay silent, avert their eyes so as not to make eye contact with the gorilla and step away from the exhibit so as not to agitate him; a child and his mother would not scream or shout; a keeper would be right there to direct the calm gorilla; the gorilla would listen to the keeper and respond; and the child would be saved. But that didn’t happen here. 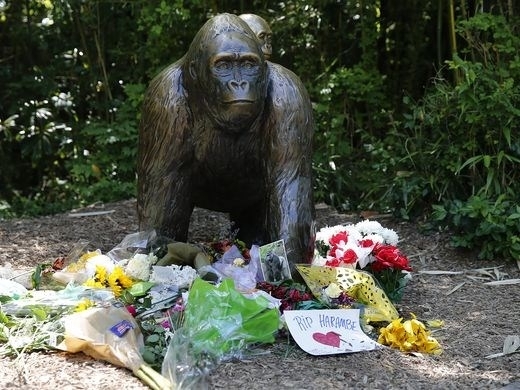 People were screaming, Harambe became upset and suddenly that child’s life was in imminent danger — whether intentional or not, Harambe was about to grievously injure or kill him. All it would have taken was one crack of the head on pavement, being held underwater, being dropped from a climbing apparatus, or simply being squeezed too tightly in hands that don’t know their own strength. There was just one heartbreaking way that little boy’s life could be saved. And the zoo did it right. And this brings us to the animal himself. As I’ve written before on this blog, gorillas are intelligent, caring, family animals. They can make conscious decisions, solve problems, and they have empathy and foresight. Harambe will certainly be missed by his keepers and all the other humans whose lives he has touched. Zookeepers and veterinary staff care deeply for their animals. I’m sure they’ve watched that video dozens of times wondering if they should have, could have done something different. But at least they understand what happened to Harambe. Anyway, whatever, it is a devastating loss to the zoo, and to the gorillas. How did the others react? Are they allowed to see and express grief, which seems to be so important. Let’s consider for a minute that gorilla’s have the same emotional capacity that we do — it’s not a fartetched thought. If so, then those other gorillas are hurting too. I hope they got to say goodbye to Harambe in their own way and are allowed time to grieve. If so, the zoo will have done everything right. Harambe is a Swahaili name meaning working together, pulling together, helping each other, caring, and sharing. Let’s try to do that, shall we. PreviousI found Canada’s largest spider… in my garage!